Merchandising is an extremely important part of the international sports industry. And it’s no different in floorball. Many clubs have already discovered its potential for their own budget, identity and even team strength. Others act pretty dozy. But don’t worry, we’ll wake you up. When you enter Warberg’s home arena, the Sparbank Wictory Center, you’re being hit by a blue wave. Kids and parents, dressed in blue replica jerseys of their favorite players, waving flags and scarfs. The classic visuals of dedicated fans. 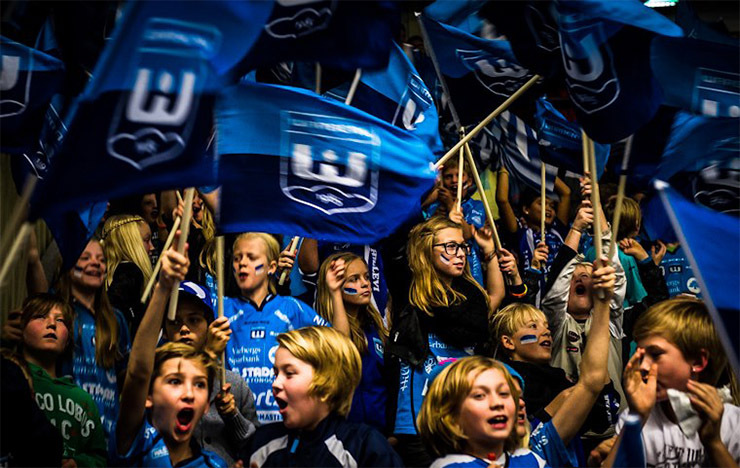 In fact, Warbergs IC was one of the first floorball enterprises that understood the power of good merchandising. Other clubs followed. According to Statista in 2016 the international sports merchandising industry had a turnover of over 20 billion dollars (70 % of it in the USA). To many big clubs this business is a vital part of their income. Just an example, rumor has it, that when David Backham was transferred to Real Madrid for 35 million Euro, the club’s annual jersey sales grew by 50 million. Why to merchandise at all? Well, the floorball business might be far away from such numbers. However, that doesn’t mean that clubs cannot profit from merchandising in a similar way. Actually, because all trademarks still lay in the hands of the clubs, it’s just up to you what you make of it. Your club will benefit from proper merchandising on several levels. First, if you find the right set up, you can add some solid money to your club’s income. Grasshopper Zürich are supposed to have sold over 350 Kim Nilsson jerseys. Though you might not be Grasshopper Zurich and you might not have Kim Nilsson on your team list, imagine if at least a part of you club member’s parents, spouses or friends would get a fan shirt, a fan scarf or a fan mug. But it’s not just about money. What you see and feel at Warbergs IC is worth much more. By connecting your club members and fans with such visuals off the rink, you build an important part of your clubs identity. When your supporters arrive at a home or an away game they see their comrades and something happens. Individuals grow together, they grow stronger, they grow into an entity, into a confident community, where everybody’s equal. Your team will feel this power on the field, too. Besides, clubs with a strong merchandising department seem more vivid, more successful and simply more professional. This raises your attractivity towards sponsors, players and new club members in general. How to find the right business model? Many clubs just don’t know how to integrate merchandising into their daily routines. Often there are hardly enough people to handle the basic administration and nobody wants to take care of such a time-consuming issue. Actually, it might get easier than you think. Merchandising platform: On several platforms you can easily create your own fan shop by providing the designs and they will take care of the rest (i.e. spreadshirt.com). You just brush up your logo, pick the products you want to put it on and then you send your supporters to your own branded store. The platform sells, produces and ships. At the end you receive a commission (margin between 5 and 40 %). The disadvantage of such a set up is that it’s purely digital. If you want to offer the products at your home matches, you have to buy and resell. Partner shop: If you have a partner shop already, ask them about including merchandising in their service. Most sports retailers cooperate with printing companies that have merchandising products in their portfolio. Some shops can even create a branded sub page on their websites for you. As you provide them with your trademark, you can demand royalties (margin between 10 and 30 %). They sell online or put up a fan shop at your events. Own store: Larger clubs with a vast member base, such as Warbergs IC, can even set up their own fan shop. This will allow you maximal financial profitability (margin up to 100 % and more) and you can approach your folks with your merchandising products more intensively. However, you’ll also have to bear all the risks and costs a regular store has to bear (customer care, stock, logistics, administration etc.). Try to focus on less products, but keep them deliverable. There is a number of classics every fan shop should offer: Replica jerseys and fan shirts, scarfs and simple memorabilia. Some retailers also offer customized products. Then you can for instance print your name or number on the club jersey. Others add optional products such as flags, caps, training sets, towels or gym bags. Some brands can even produce your own stick series (mostly starting at around 500 pieces). A club’s Corporate Identity is a topic of its own. However, your enterprise should have a clearly defined “look & feel”. It’s not just about a stylish logo. Define color codes (read more at “10 Rules How Your Club Should Work With Colors“), fonts and graphics to work with, so your material matches to the whole communication of your club. If you don’t feel confident in this, ask some designer for help. It will pay off. To sponsors clubs with a strong merchandising department are more attractive. Brands and shops see possibilities of additional sales, other sponsors appreciate the presentation of their logos not only on but also off the rink. If you create your own line discuss the production with all of them. Brands can provide you with cheaper products, other sponsors perhaps already have merchandising material you could include. When planing the production and communication of your fan line, plan in seasons. Start advertising your products before the first matches. You can also prepare forms with which club members can directly order their products when signing in for the new season. By this you can make bulk orders and get better prices. You’re something like a business on your own now. If you want to make sales, it’s not enough to hide your fan shop in some sub menu on your website. Place some cool banner in your sidebar, spread social media posts with your products, print flyers, give some shirts away for free so people see them. Get the message out! It’s great to show your supporters the fan line in real life. But don’t forget that not every potential customer is visiting your home matches. Some parents just focus on the youth segment, many recreational players rather go fishing on the weekend. And perhaps you even have fans abroad. Create some simple online offer like Warbergs IC or FbS Bohemians did. Build an own online store (there are many templates and services at WordPress & Co.) or sell via platforms such as Amazon. If that’s too much work, at least provide basic information like Grasshopper Zürich. Bear in mind that in many countries clubs do not have the same possibilities of earning money like regular businesses. Discuss your merchandising plans with your financial department or perhaps even with a tax advisor. If you want to build a proper merchandising platform, you should avoid legal problems right from the beginning.